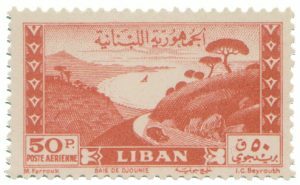 This piece of paper, a copy of the uncommon redrawing of the Bay of Djounie 50 Piastres stamp reissued in 1949 originally in dark red-orange (Michel n 425), is apparently absurd with blue print, but really it is not (fig 1). 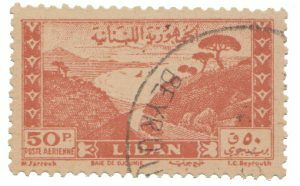 It is actually a print proof to improve the realization of a dangerous photo-zincography fake of the redrawing 50 Piastres stamp. It was made in blue to better observe the defects of the basic cliché in order to identify and correct the wrong parts. In fact, in addition to the stain of color in the shape of a “V” under the sailboat, other imperfections are noted above all in the external linear frames and in the inscriptions below. But let’s go by order. In the 60s, the general well-being and therefore the desire to invest looking for a quick financial return, focused on the world of philately, hobby held by a more or less wealthy social class. 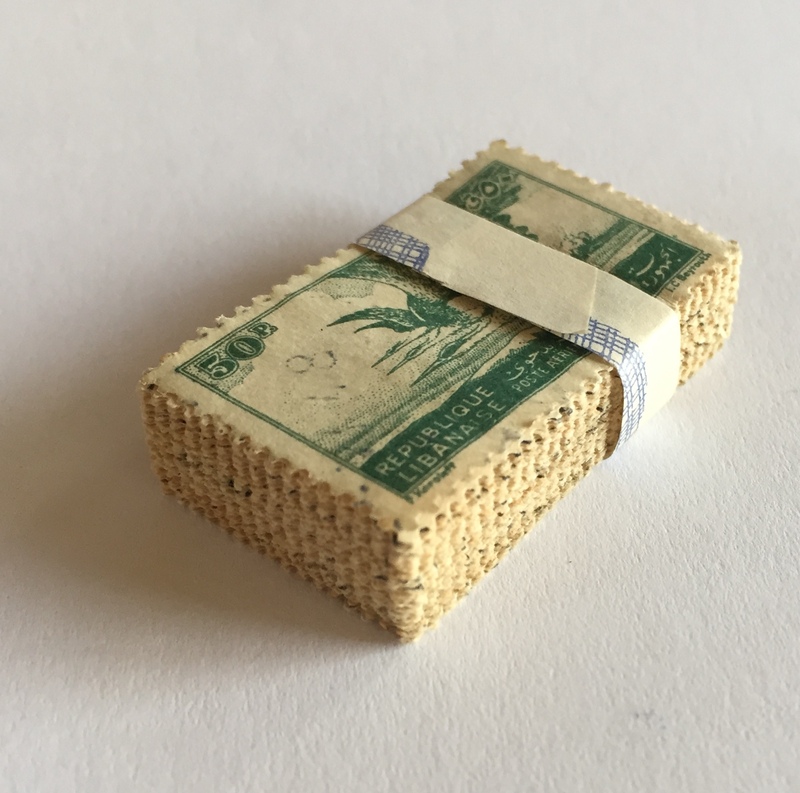 One of the most interesting and lucrative forms was that of the decks of 100 used stamps (fig 2), required by the market to prepare the famous envelopes with “one hundred different stamps” of which we have all been at least once buyers. So I said of these decks, which system is cheaper and faster than to “produce directly itself” the used stamps, without going through the chain of work including the annoying neckline in the water of the stamps? This principle was the one that pushed a group of philatelic operators of Beirut, towards the end of the 60s, to the self-production of used stamps in order to place them in the market of the decks of 100 stamps and consequently in that of the envelopes with 100 or more different used stamps. 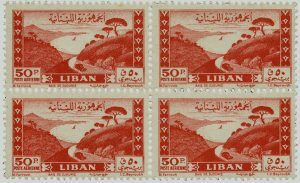 Returning to our 50 Piastres stamp that was the star of this production (yes! there are many other fakes, products at the same time with the same purpose), it was intended to compose valuable decks of 100 used stamp that served to whet the appetite of the buyers. We can therefore observe what was the final product (fig 3 and 4) and we must admit that it was very high quality, proportional to the professional skills of the producers (unfortunately today these “artists” have disappeared giving way to squalid individuals without every scruple and art, ready to sell their mothers too for some banknote). Now let’s look at the few and substantial differences with the original (fig 5). The paper of the latter is whitish and compact, while in the false ones it is creamy with small flaws in the pasty composition. 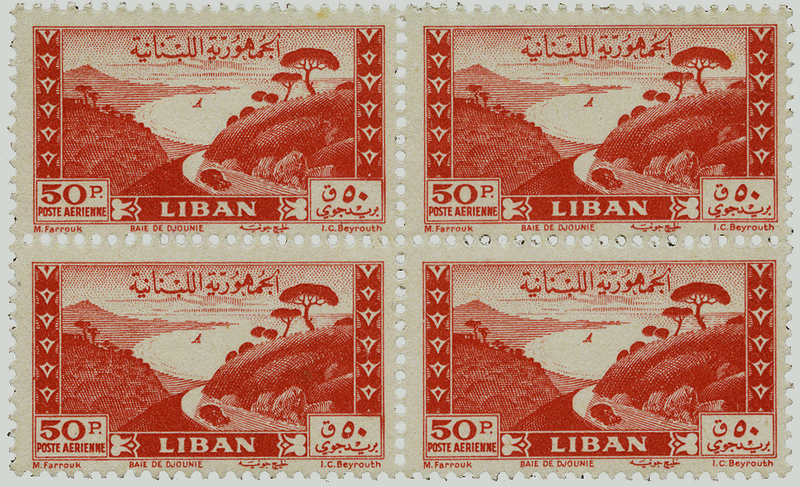 The printing of the original was made with the so-called “offset” system, i.e. with the reproduction of the original print left by the copper cylinder on a rubber cylinder and from this on the sheet of paper. The fake was produced with typographic printing of excellent workmanship. The color is almost similar except in the original is dark red-orange while in the fake is dark reddish-orange (scale translated by Michel Farbenfuhrer in German). The perforation is almost similar 11½ X 11¾ in the original, 11½ X 11½ in the fake, where there are also small differences in the diameter of some holes. Where to observe the most indicative differences? But as already mentioned! in the writing below: they are clear and regular in the originals, confused and irregular in the fakes (fig. 6). It remains to be added that you will never risk to meet this fake stamp in mint condition: they were all made “used” for the decks of 100 stamps, through a cancel of Beirut also fake. 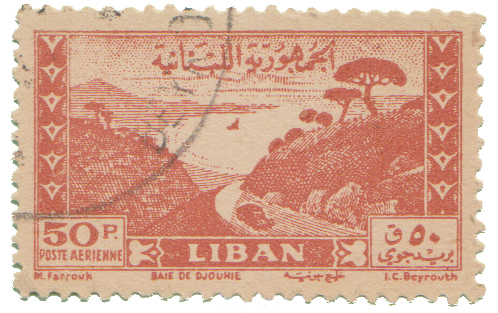 made with a horizontal pair and a single stamp sent from Beirut on 8 June 1950 to fulfill the required rate of 160 Piastres for weight up to 30 grams to USA (fig 8).